Democrat James Carville said Sunday that conservative commentator Glenn Beck is 'out and out nuts' while Carville's wife, a Republican, had kinder words about the Fox News anchor. WASHINGTON (CNN) – Fox News anchor and conservative commentator Glenn Beck was taking incoming fire Sunday from both ends of the political spectrum, but especially from Democratic strategist James Carville. 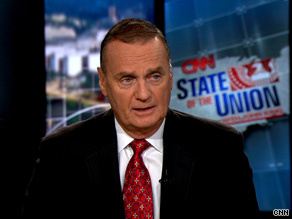 "I think he's nuts, OK?," the outspoken Democrat said Sunday on CNN's "State of the Union,"
"Just out-and-out nuts. And I also think that he's a blatant hypocrite," Carville said. "Here's somebody that sits on his show ... weeping about how much he loves America and ... and then he's absolutely giddy when his country doesn't get the Olympics. And this is - I'll tell you another thing about Glenn Beck. He wouldn't know the difference between a football, a bat and a hockey court. This guy is not - he's just all - he's just all weeping." Carville was reacting to earlier comments Sunday on Fox News, where Republican Sen. Lindsey Graham of South Carolina made it clear that he was not a fan of Beck. "[H]e doesn't represent the Republican Party," Graham said of Beck, "When a person says he represents conservatism and that the country is better off with Barack Obama than John McCain, that sort of ends the debate for me as to how much more I'm going to listen." "So he has a right to say what he wants to say. In my view, it's not - it's not the kind of political analysis that I buy into," Graham said. 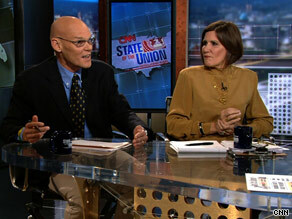 Republican strategist Mary Matalin disagreed with Graham and with Carville, who is her husband. 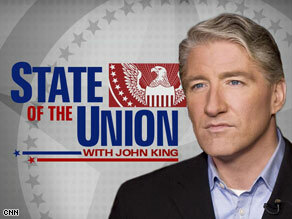 CNN's John King looks back at Sunday's talk shows and what will be making news this week. *A characterization of the security situation in Afghanistan that seemed, to us anyway, more optimistic than the assessment the commanding general of U.S. forces made in his report to the White House requesting more troops. *And a statement that made pointedly clear that the White House, or General Jones, at least, is less than thrilled that Gen. Stanley McChrystal is lobbying publicly for more troops at a time the administration wants time to consider its overall Afghanistan strategy. Sens. Kyl, a Republican, and Boxer, a Democrat, both had very little to say about the preliminary investigation into the conduct of Republican Sen. John Ensign that is going on in the Senate Ethics Committee. WASHINGTON (CNN) – The chair of the Senate Ethics Committee said Sunday that a preliminary investigation has begun into the conduct of Nevada Republican Sen. John Ensign. Ensign admitted earlier this year to an extramarital affair with a married campaign staffer. A recent report by the New York Times suggests that Ensign went to great lengths to aid the staffer’s husband, who also worked as an aide in Ensign’s Senate office, and, in the process, may have encouraged the possible violation of Senate rules regarding lobbying. Asked about the specific issues the investigation is looking into, Boxer said she was not permitted by Senate rules to do so. Asked whether Ensign could serve effectively with an ethics investigation pending, fellow Republican Sen. John Kyl of Arizona said he would “wait and see what happens” with the Ensign investigation. Sen. Jon Kyl said Sunday that the Obama administration should not allow tax marginal rates to go up. WASHINGTON (CNN) – A leading Senate Republican said Sunday that the Obama administration should consider keeping marginal tax rates at current levels in order to help small businesses who may be struggling in the midst of a down economy. 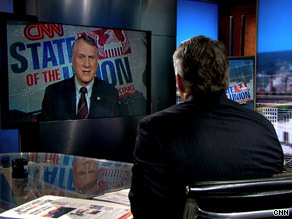 “Don’t allow taxes to go up,” is how Senate Minority Whip Jon Kyl responded Sunday on CNN’s State of the Union when asked what the president could do to help with job creation as the national unemployment rates inches closer to ten percent. Kyl rejected two major Democratic agenda items – health care reform legislation and an energy bill that would create a cap-and-trade system for emissions – as viable methods for helping the economy. Kyl said both initiatives, if enacted, would cause the economy to lose jobs. Democratic Sen. Barbara Boxer of California disagreed. Boxer, who recently introduced an energy bill in the Senate, said that legislation intended to deal with climate change and promote American energy independence would result in increased private capital coming into the economy. WASHINGTON (CNN) - A bill to overhaul the nation's ailing health care system must avoid additional spending now, and also lower costs down the road, former Federal Reserve Chairman Alan Greenspan said Sunday. Greenspan told the ABC program "This Week" that the federal debt was already getting too big, so reforming health care must do more than achieve what politicians call revenue neutrality - bringing in as much money as it costs. "You cannot continue to increase the federal debt," Greenspan said. He noted that the Medicare program for senior citizens already requires long-term borrowing to cover the costs of benefits, describing it as a "huge fiscal hole out there." "I would say revenue neutral is not adequate" Greenspan said. "In other words, we have to not only have a revenue neutral reform program, but simultaneously recognize that we have to address the longer term." I don't play politics with national security, Obama adviser and retired general James Jones said Sunday. WASHINGTON (CNN) – A top military adviser to President Barack Obama said Sunday that politics does not play any role in the advice he gives to the president. Last week, Sen. John McCain, R-AZ, the former Republican presidential hopeful, said on the floor of the Senate that Jones was one of the president’s advisers who doesn’t “want to alienate the left base of the Democrat [sic] Party” as the White House considers whether to send more troops to Afghanistan. Asked to react to McCain’s comments Sunday, National Security Adviser James Jones said he “took exception” to McCain’s remark. WASHINGTON (CNN) – One of President Obama’s top military advisers said Sunday that the United States is at a crossroads in its strategic approach to Afghanistan. 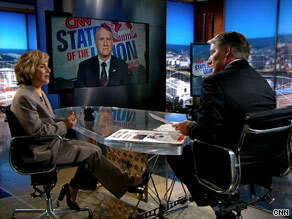 “This is a strategic moment,” National Security Adviser James Jones said on CNN’s State of the Union. In March, the president announced a plan to send additional troops to the country in order to provide security for a national election and to begin to lay the groundwork for a larger footprint for the U.S. military operation in the country. The Afghan effort, many military observers believe, was under-resourced during the Bush administration because of the focus on the war in Iraq. Jones pointed out that since March three developments have led the White House to reconsider its overall Afghanistan strategy: the national election occurred where there are questions about the legitimacy of the outcome; General Stanley McChrystal was named the new top U.S. commander in the country and McChrystal has concluded that the Taliban is stronger than previously thought; across the border from Afghanistan, the Pakistani government is doing much better than anticipated, changing the overall dynamic in the Afghanistan-Pakistan regional theater. Jones also said Sunday that he did not believe Afghanistan was in danger of falling back into the Taliban’s hands. “The key in Afghanistan,” Jones also told King, “is to have a triad of things happen simultaneously.” In addition to security, the country needs economic development and “good governance and the rule of law,” Jones said.